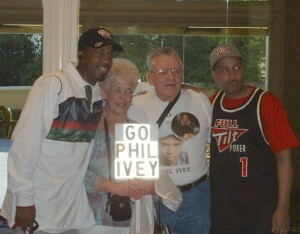 Mel and Pat Humphrey stood near the entranceway for quite a while and took photos with all the spectators that wanted to pose with them. Wendy Moon, Darvin’s wife, was very visible throughout the day in the shops, eateries, halls, and Penn & Teller Theater (of course) and very friendly and accommodating to the fans. 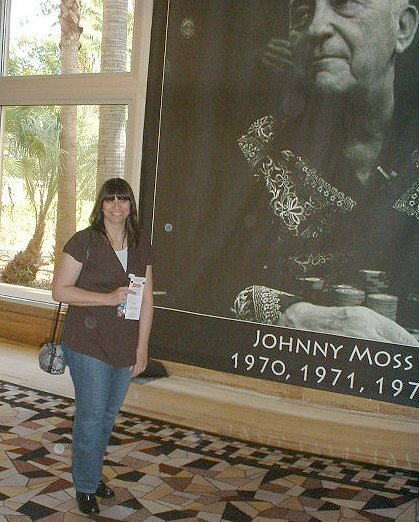 Here she poses in front of a banner of the great Johnny Moss, a multi-time champion of the WSOP. Banners of former WSOP Champions lined the (waiting) hallway of the Rio. 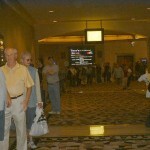 11/07/09 11:12am - Wendy Moon (Darvin's wife) stops to pose as she walks by the line of spectators waiting to get into the 2009 WSOP Final Table. Greg Raymer walked down the very long line of spectators several times. 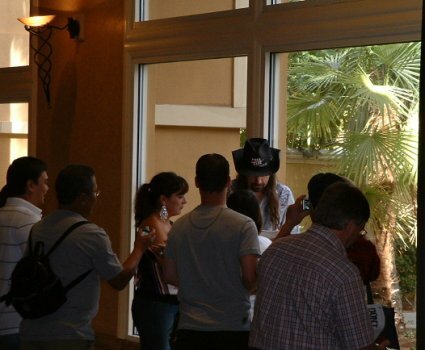 He was super friendly and very accommodating to the fans – signing autographs left and right. 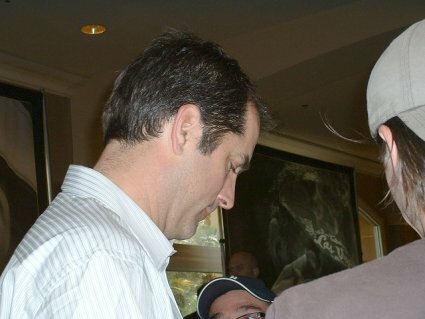 11/07/09 11:14am - Greg Raymer signing autographs. 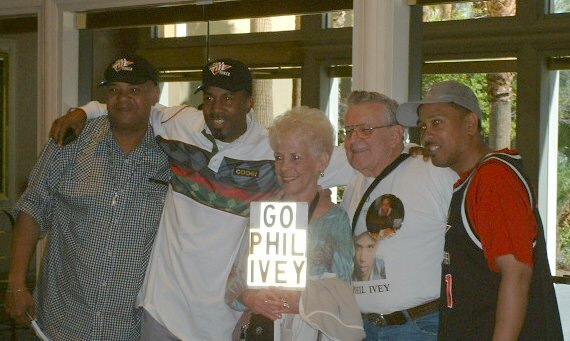 Phil Gordon was also generous with his time and walked the line of spectators waiting to get into the WSOP a couple of times, stopping along the way to sign autographs. 11/07/09 11:35am - Phil Gordon signs a copy of his book, Phil Gordon's Little Green Book of Poker, for the guy in front of me (with gray the hat). The guy asked, "Hey, Phil will you sign my book?" To which Phil replied, "Your book? I'll sign your copy of MY book for you." Chris Ferguson arrived a few minutes before 12:00 (scheduled start time). 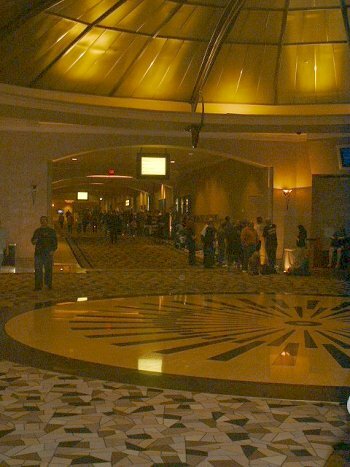 Getting into the WSOP covered getting into the WSOP the first day of play, Saturday, November 7, 2009 when the November Nine met at the Main Event Final Table and played down to 2. They started at Noon on Saturday and played until 5:57AM Sunday morning. 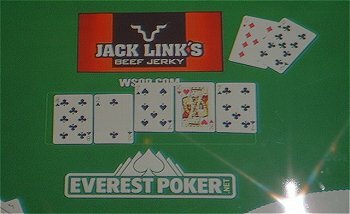 This post covers getting into the WSOP’s second day of Final Table play, Monday, November 9, 2009 when the final 2 played for the championship of Event 57, the $10,000 No Limit Hold’em tournament of the 2009 WSOP. Just like Saturday, getting into day two of the WSOP Main Event Final Table was a matter of time. How much you want to witness the final 2 = the amount of time you invest in standing in line. All you need to do is get to the Penn & Teller Theater at the Rio All-Suite Hotel & Casino at a time that will get you into a nice place in line. Arrived at the Penn & Teller Theater at the Rio All-Suite Hotel & Casino. Got in line. This time, I was not in as good a position as on Saturday. 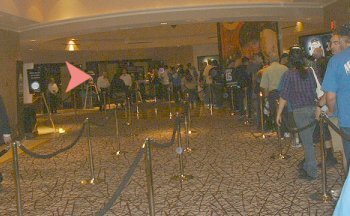 I was in line down in the rotunda portion of the hallway about 150 feet from the entrance, and unlike Saturday were the line cut diagonally across the rotunda, spectators were lined up against the walls (meaning many more were in line). There were about 70 – 80 more people in front of me. It was hard to tell with more accuracy because the spectators were very spread out. Line begins moving slowly, advancing about 15 – 20 people at a time. I am seated in the first balcony (mezzanine of Penn & Teller Theater). View was excellent because there were not as many camera people nor camera apparatus blocking the spectators’ side of the table. Both players are on stage. Darvin Moon is signing autographs on the left front of the stage and Joe Cada is on the right side of the stage talking with supporters decked out in their yellow long-sleeve “Cada” t-shirts. Curiously enough, Davin Moon is wearing a yellow shirt. Hummm… earlier in the day, I had read an article in the Las Vegas Review-Journal which quoted Moon as having said, “…Cada is favored“. I’m wondering if Moon was trying to send a message with his choice of tops. Both players approach the table. Red arrow on left points to Darvin Moon standing in front of his seat. Red arrow on right points to Joe Cada wrapping up the conversation with his yellow-t-shirted supporters. 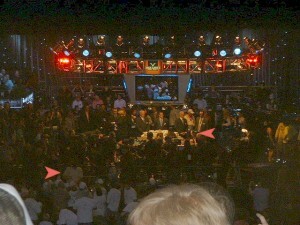 Final hand is played and 21-year-old Joe Cada emerges as the champion of the 2009 WSOP Main Event. Cada had 9d 9c. Moon had Qd Jd. Board was 8c 2c 7s kh 7c. 1:29 AM Tuesday, Nov. 10 - Moon and Cada play the final hand and Cada wins. Found this video on YouTube. It is the last 5 minutes of ESPN’s coverage of the Final Table. 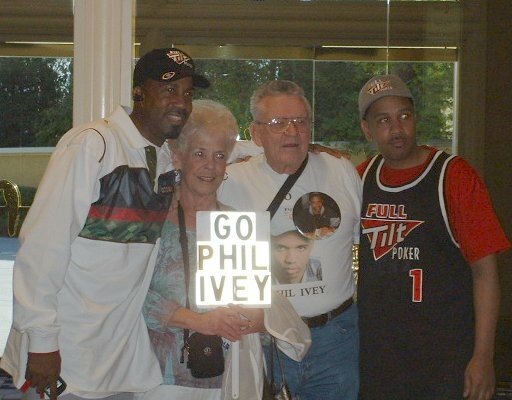 I planned the trip to Las Vegas to attend the 2009 WSOP Main Event Final Table back in late July after having followed the WSOP events online from May 27th – July 15th. Before booking the trip I did research on how to get into the WSOP. The general concensus was that you just had to show up and wait in line. And so, it turned out to be. Getting into the WSOP was easy. Finding information about the schedule was a challenge. The Final Table was scheduled for November 7 – 10. As the date approached, I visited the WSOP website daily looking for the schedule. I asked around at the poker forums and learned that there were many of us waiting for the schedule to be posted. 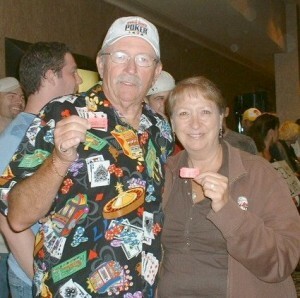 I finally found it at the WSOP website October 30, 2009. The post was dated October 19th. Hummm… I had scoured the site. WSOP did a site upgrade around that time, so, I think it had been posted on a development site and then made live when the upgrade happened. Anyway – if your planning on going, looks like the schedule is posted 1 – 2 weeks prior to the date of the Final Table. Arrived at the Penn & Teller Theater at the Rio All-Suite Hotel & Casino. Got in line. In about 200th spot. My waiting spot was diagonally across from the Theater’s entranceway to the right. I was able to see many poker pros enter. Some stopped for photos and to sign autographs (kudos to Greg Raymer and Phil Gordon who were really generous with their time) and others, well, didn’t have the time (who else but Phil Hellmuth – a true Brat). I didn’t get photos of everyone, but, I’ll post the ones that I did get later. There was movement in the line ahead of me. Nothing serious, but, people were slowly moving up. We didn’t know whether they were being seated or groups gave up and left. Then another movement, and another, say 10 – 15 people at a time. There are really two lines. The line I was in “graduated” to another line across the hall. Before crossing the hall, I was given a red ticket – like a standard raffle ticket. When I got to the other side of the hall, I got in that line. 10 – 15 people were seated at a time. Before getting into the about-to-be seated line, the ticket was taken and my hand was stamped. I was escorted to a section of the Theater and chose a seat. Saturday 12:28PM spectators ahead of me in the Red Ticket line. 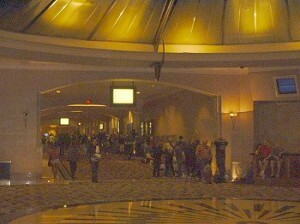 Red arrow points to doors of the Penn & Teller Theater. Just a few more feet. So once the line started moving at 11:45 AM, it kept moving with small delays in between. I was in a seat in the second balcony (great view) by 12:30 PM and the ceremony started at 12:40 PM. (Yep, later than the scheduled time.) I was seated behind three rows of Begleiter fans all dressed with their Begs Begs Begs t-shirts. What do you do while waiting in line to get into the WSOP? Take pictures of the poker pros arriving. 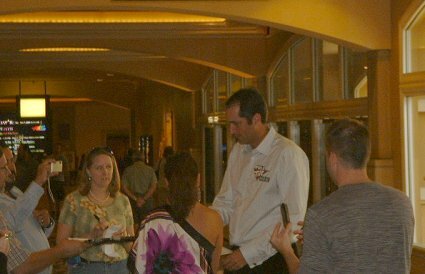 Here’s photos of some of the poker pros I saw while in line. 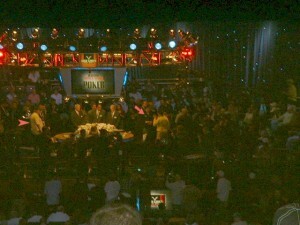 Oh yeah – and I made it into ESPN’s coverage of the 2009 Main Event Final Table. Here’s a YouTube video of the intro. I’m in the section where Lon McEachern says that “thousands waited in line…”. Players were given 2 hours (7PM – 9PM) . The dinner break was interesting. The Theater was emptied. When you return from dinner, you get back in line. There are a number of lines and the one that you wait in depends on the kind of credential you have. If you are a member of a player’s support team or staff or the press, you have a wrist band or lanyard with photo id, and you go right through. If you are the general public with a stamp on your hand, you wait in one line. If you are general public without a stamp on your hand (i.e. never made it into the Theater earlier), you get into a different line. Once all the credentialed folks are seated, the stamped hand spectators are seated, then the never-been-stamped spectators are seated. During the day, I had a seat in the second balcony. After dinner, I was seated in the first balcony…considered a “promotion” I suppose, but the view was not as good, so I was glad I had binoculars. Poker commissioner, Jeffrey Pollack introduced Mike Sexton the only 2009 inductee into the Poker Hall of Fame. Joining him on stage were former Poker Hall of Famers Doyle Brunson, Jack Binion, Dewey Tomko, Phil Hellmuth, Billy Baxter and T.J. Cloutier. Left for the day. I had been bobbing my head since 11:00 PM and getting confused about the hands. Since the play was going so slow, I decided to call it a day and return early in the a.m. to catch the rest of the action. Little did I know that all the action would happen between 12:00 AM and 6:00 AM… and then there were two, Cada and Moon. If you are going to Las Vegas from any distance, make sure you get plenty of sleep the days prior to the WSOP Final Table. I had flown in the day before, got only 4 hours sleep, hadn’t adjusted to the 3-hour time difference, and then couldn’t see straight at 11:30 PM the night the 9 played down to 2. Had I flown in a day earlier and got a decent amount of sleep, I would not have missed any of the action. Eat a hearty breakfast before arriving. Bring a light snack and plenty of water. Water at the closest place (Starbucks) was $5.00 a bottle. Bring binoculars so that you can see close ups of players’ actions and faces. Bring a camera that does not require a flash. No flash photography allowed. They announced it several times during the afternoon session. Then again during the night session. Then they announced, “This is the final warning about flash photography”. Then they escorted those who broke the rule out the door. Seating at the Penn & Teller Theater. This PDF is a very close replica of the seating during the 2009 WSOP.